We want to encourage members to keep AFSA’s Fund for American Diplomacy in mind as they consider their charitable contributions. 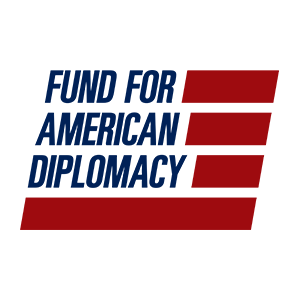 The Fund for American Diplomacy, one of AFSA’s two 501(c)(3) arms, supports outreach to tell the proud story of the Foreign Service to the American people. The FAD’s aim is to build a domestic constituency for the Foreign Service so that we have supporters, ideally in all 50 states, prepared to stand up for the Foreign Service and defend our vitally important mission. You may make a donation by clicking here. The Fund is also registered in the Combined Federal Campaign as “Diplomacy Matters-AFSA” and its CFC number is #10646. We appreciate your support. All donations to the FAD are tax-deductible. Strategic and Outreach Partnerships - AFSA maintains close ties with like-minded national organizations whose networks can be utilized for amplifying our message and reaching those living outside the Beltway bubble. AFSA Outreach Events – AFSA maintains a robust program of events aimed at promoting diplomacy and educating students and the public about the Foreign Service. These include speaker series, book talks, and panels featuring experts on various diplomatic topics. Road Scholar Program – Five-day academic programs for senior citizens to further understand U.S. diplomacy and the Foreign Service. These programs are sponsored by the national Road Scholar organization (www.roadscholar.org) where AFSA is responsible for organizing the Foreign Service program offerings nationwide. Road Scholar handles all registration of attendees, but AFSA provides all the curriculum and speakers. Minority Intern Program – Minority college students explore a career in the Foreign Service in high profile office with a substantive work assignment. The students are paid a stipend for their summer internship. Awards Program - As a professional association and labor union, AFSA seeks to highlight achievement, performance, courage and sacrifice within the Foreign Service community. Our awards program began in 1968 and has continued to expand to recognize the work of our colleagues. We are proud to be able to spotlight the best of our community for constructive dissent and exemplary performance, language ability, writing, and lifetime contributions. Inside a U.S. Embassy – Our bestselling book that shows how the U.S. Foreign Service works for America through a unique look at a-day-in-the-life of Foreign Service employees at an U.S. Embassy and in Washington, D.C.
We ask you again to please consider supporting the Fund for American Diplomacy. It has no income other than donations from people like you, who believe in the importance of the Fund's mission. For more information, contact Ásgeir Sigfússon, AFSA's Director of Communications, at (202) 944-5508 or sigfusson@afsa.org.